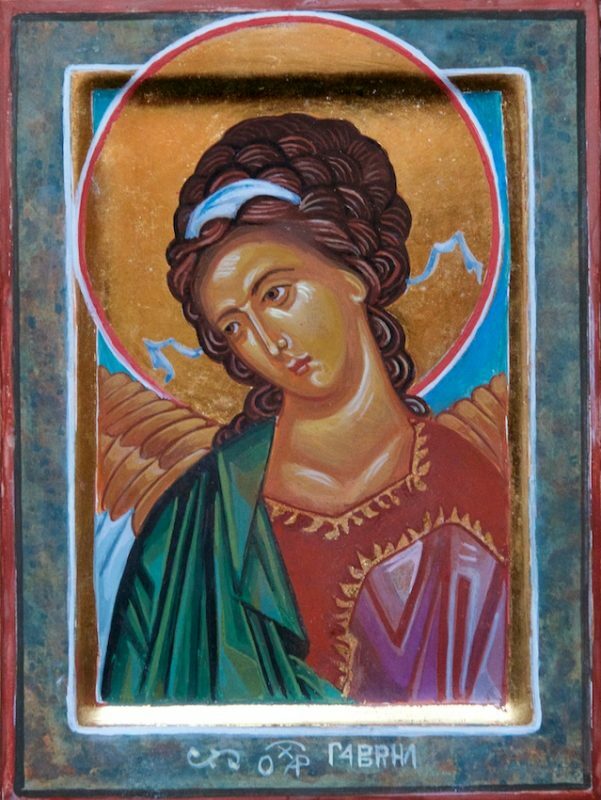 Faversham Life discovers the ancient tradition of painting icons. 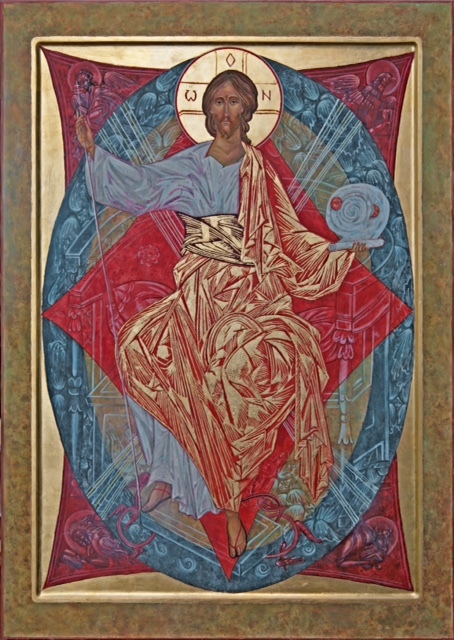 Some readers will remember the remarkable exhibition of icons painted by artists from all over the world at Oare Church, organised by Ann Welch in 2009. 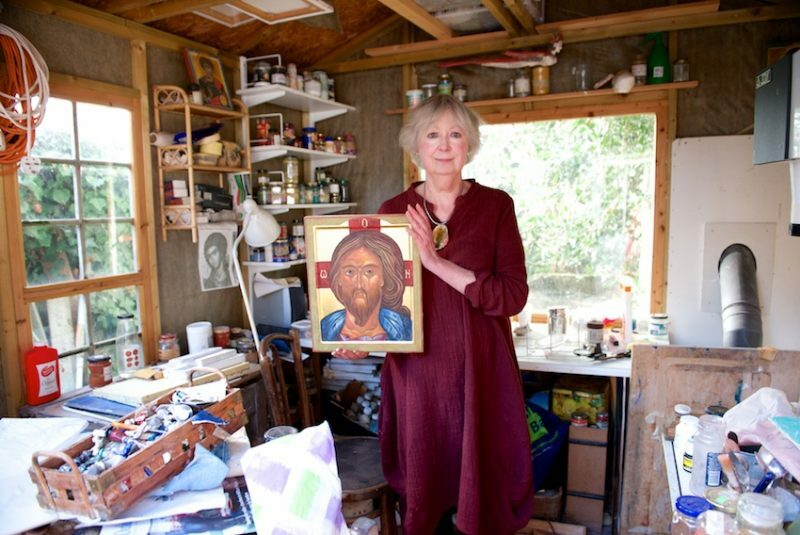 Others will be astonished to learn that a celebrated iconographer lives just outside Faversham. The 2009 exhibition included an iconostasis, the central feature of all Orthodox churches: a screen of icons traditionally used to separate the nave from the sanctuary. Icons, from the Greek for image, are pictures of Christ, the Virgin Mary, angels, saints and events of sacred history, used since before the 5th century for veneration and as an aid to devotion, particularly in the Greek and Russian Orthodox churches. They are in the Byzantine style, two-dimensionally flat-looking images of figures with a characteristically arresting gaze. The icons are painted in egg tempera on wood, and often elaborately decorated with gold or silver. Neil MacGregor in his current Radio 4 series, Living with the Gods, observes that making icons requires particular skills that go beyond the mere ability to make and manage materials. Traditionally an iconographer should prepare spiritually through prayer or fasting so that their hands are guided by God. 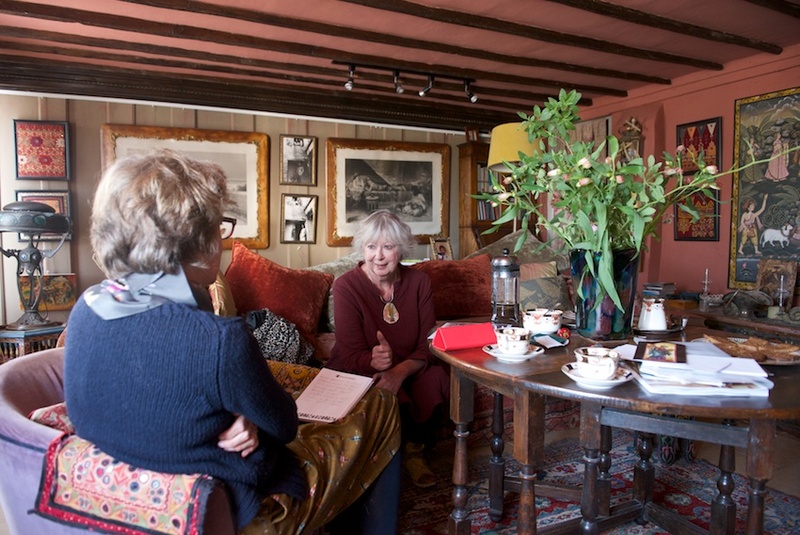 Wanting to travel, she set off to Morocco and along the way learnt the ancient art of batik in Indonesia as well as studying watercolour and oil painting in New York. 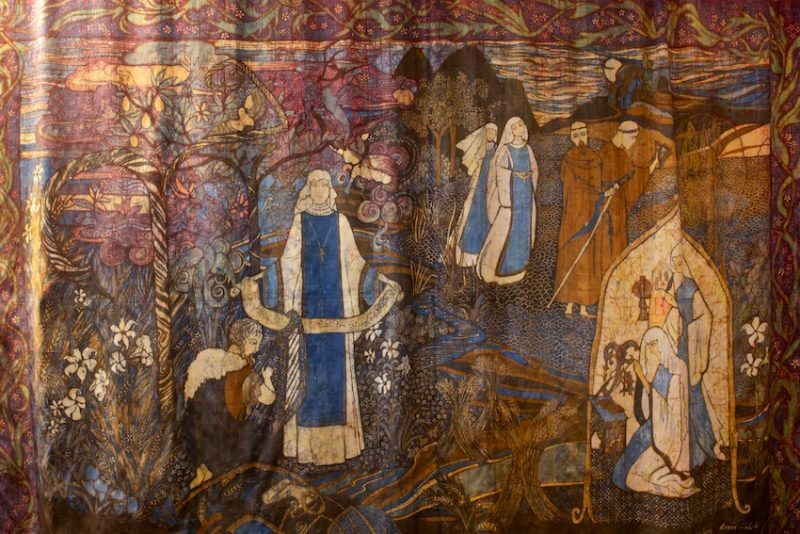 Arriving in Greece, Ann immediately fell in love with Byzantine art. At that point she thought only monks painted icons. 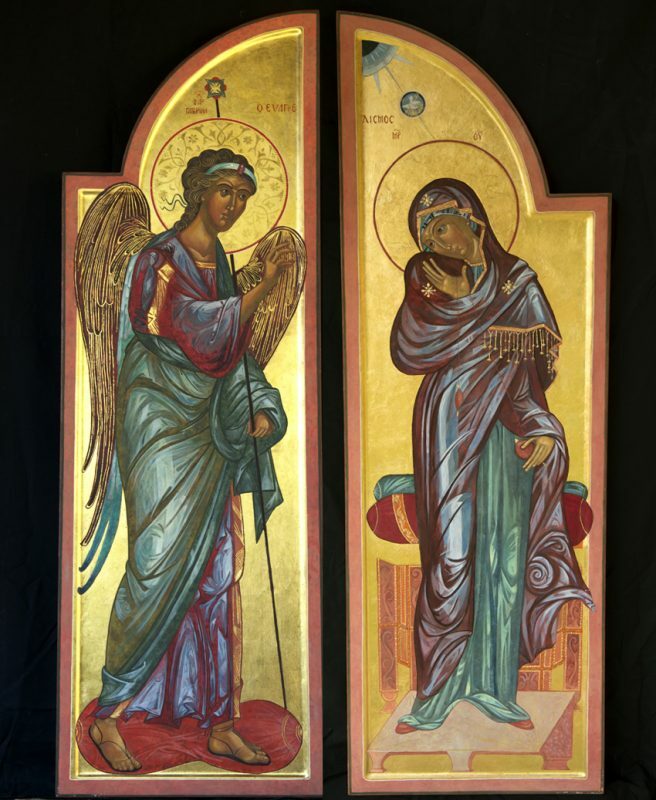 However, a chance excursion with local women to a monastery on Lesbos reinforced her desire to paint icons and led to her being introduced to a priest who in turn introduced her to an icon painter who had trained at Mount Athos. He taught Ann the basics, painting with modern acrylics but she wanted to know the ancient traditional way icons were painted. Fortuitously, she discovered that the Pratt Institute Art School in New York was running a course on Byzantine art techniques. Next she enrolled at the School of Sacred Art in Washington Square and learnt icon painting under Vladislav Andre. For her icons Ann uses poplar wood which she often purchases in that great Faversham institution M&J’s. The first step in making an icon is to cover the wood with a fine cotton cloth and brush on many layers of gesso, a mixture of rabbit skin glue mixed with either marble dust or whiting. This must be sanded well. 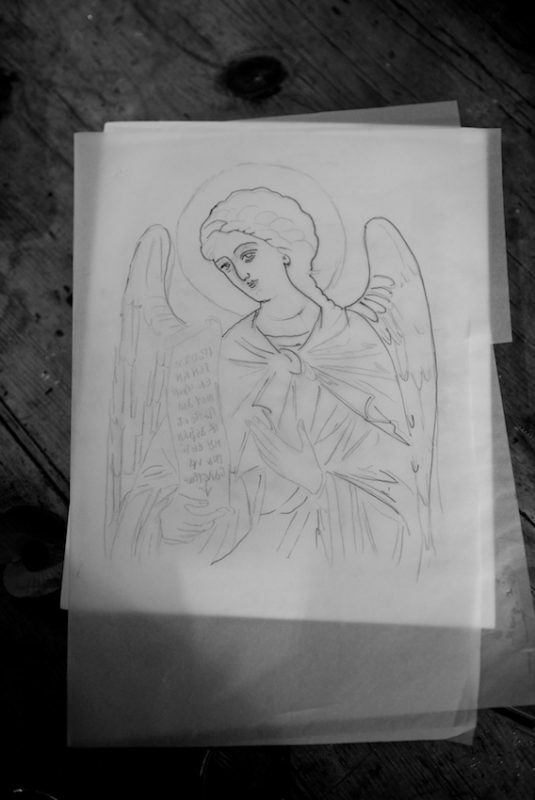 She draws her image on tracing paper, covering the back of the paper with pigment and places it onto the pure white, hopefully smooth gessoed board by gentle pressure upon the tracing paper before adding bole (clay) to the areas to be covered in gold leaf. The bole is mixed with hide glue and sanded before she applies sheets of gold leaf. ’I breathe on to the surface very heavily to ensure that the moisture helps to fasten the gold to the surface by enlivening the glue within the bole.’ These is often burnished in places to create a patterning on the gold. 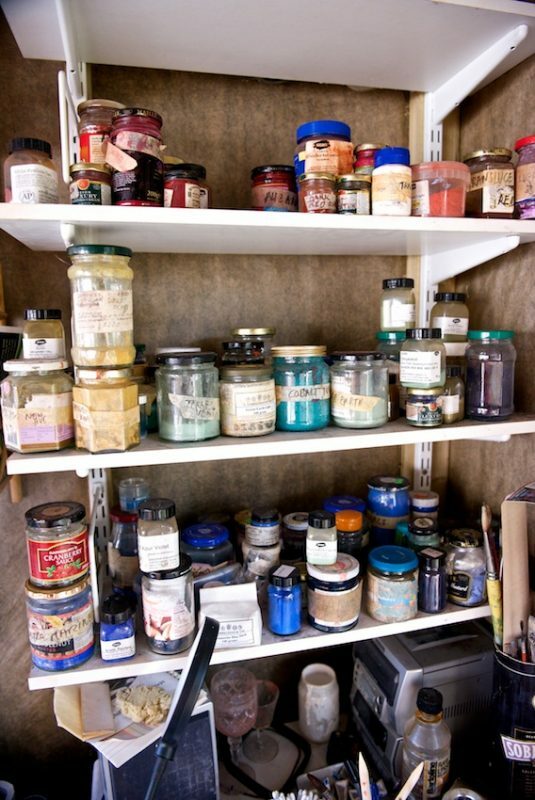 Ann uses Russian paintbrushes made with squirrel hair and works with a mixture of egg, wine and pigments, often made from powdered precious stone such as azurite, malachite and lapis. She works from dark to light colours, transparent and opaque, covering each layer with other colours with a more watery mix allowing the previous colours to show through. Finally, she paints the surface with a solution of boiled linseed oil, letting it soak for six hours before taking it off with tissue paper, leaving a fine film. 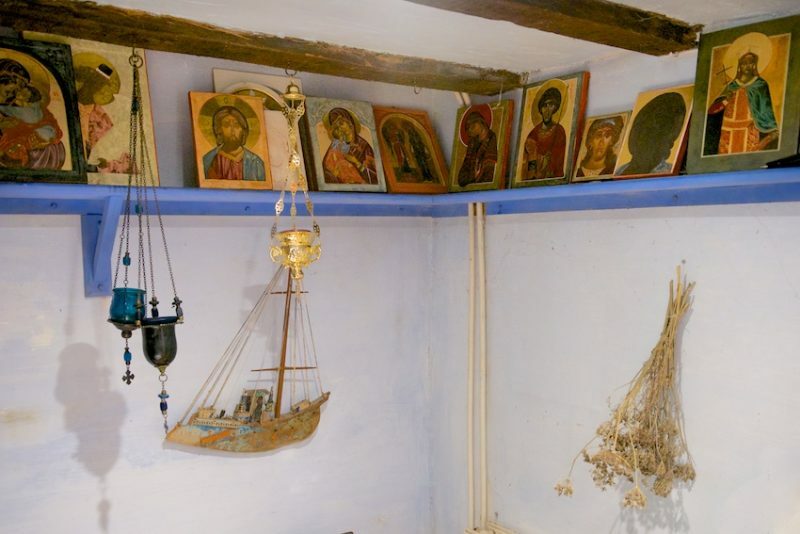 As Neil Macgregor observes, those who pray before traditional icons are part of a huge community, living and dead, who have prayed before a similar image for hundreds of years. 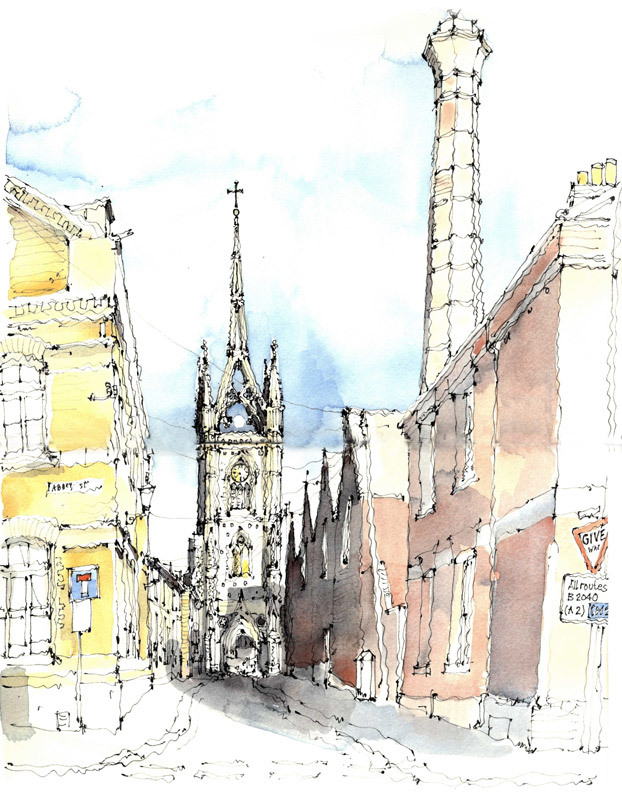 Ann will be curating an icon exhibition at the Conquest House Gallery, 17 Palace Street, Canterbury, Kent in 2018. And is organising an icon painting course on Lesbos in June 2018. Ann will also be exhibiting a selection of watercolours and oils in ‘The Island’ at Creek Creative, Faversham 10-22 April 20188. 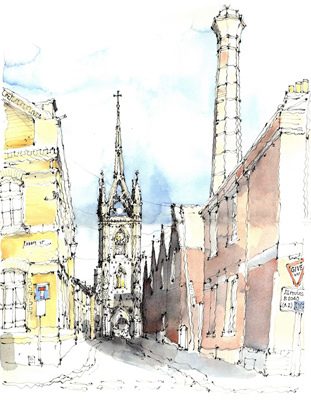 The Orthodox Eucharistic Community of St Theodore of Canterbury holds regular services in the Memorial Chapel, The King’s School, Canterbury, Kent CT1 2ES (entry via the Mint Yard gate).